How wonderful it is to end this week having you guys here on Home Bunch! I hope you had a great week and that your weekend is even better. I certainly am planning to relax a little. 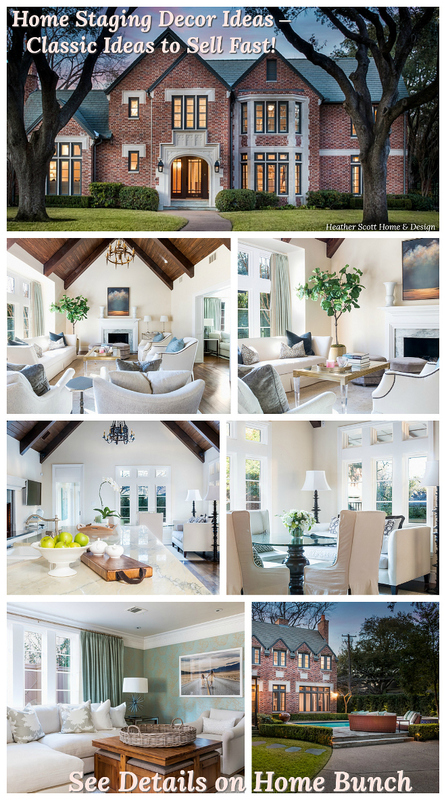 I am excited to be sharing this beautiful home on our “Interior Design Ideas” series. 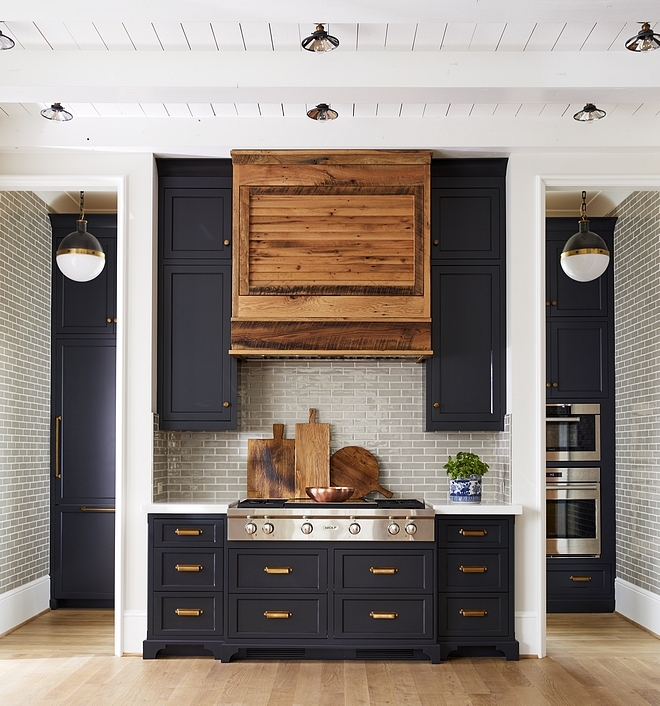 Recently built and designed by Mary Ludemann of New Old, LLC, this home features all the trends that are being loved lately: painted brick exterior, shiplap, White Oak hardwood flooring, dark-painted kitchen cabinets, herringbone flooring, subway tiles – the list goes on! 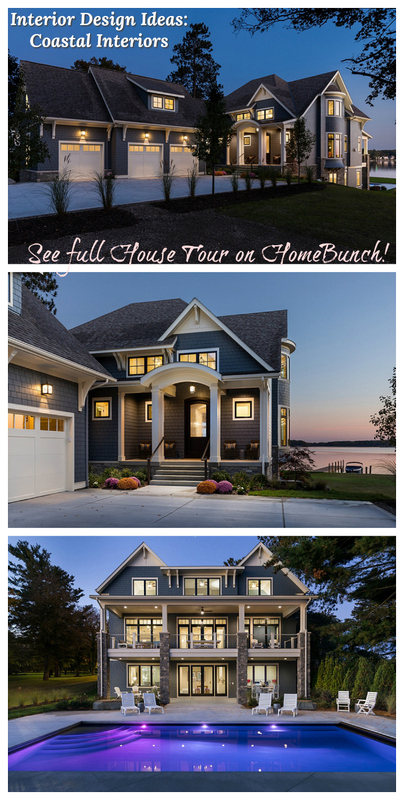 Take notes on all sources shared by the builder and have fun pinning your favorite pictures on Pinterest! This one is sure to inspire! 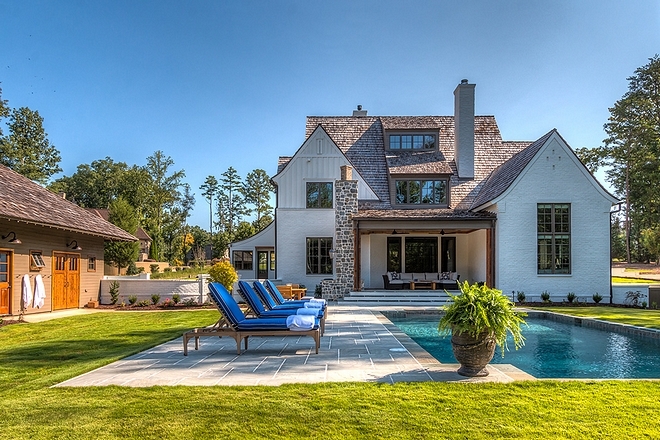 Painted Brick Exterior Paint Color: Sherwin Williams Roman Column SW 7562 painted brick/trim/board & batten, siding. Sherwin Williams Smokehouse SW7040 – window trim and garage paint color. 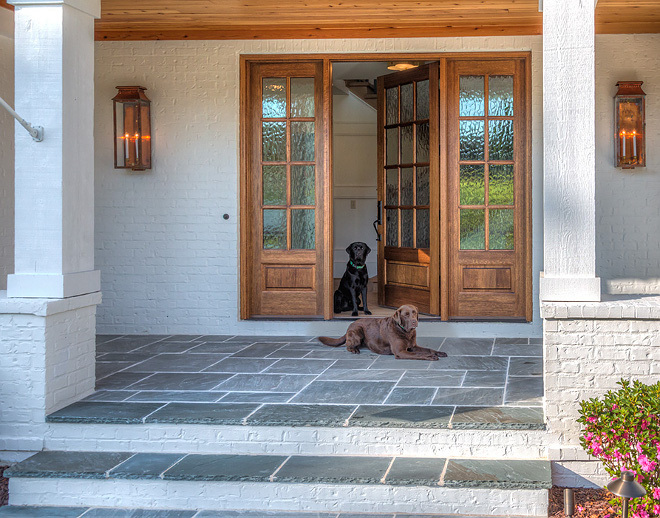 The front door is Mahogany, stained in Minwax Provincial. Ceiling is Cedar, with no stain with clear flat poly. 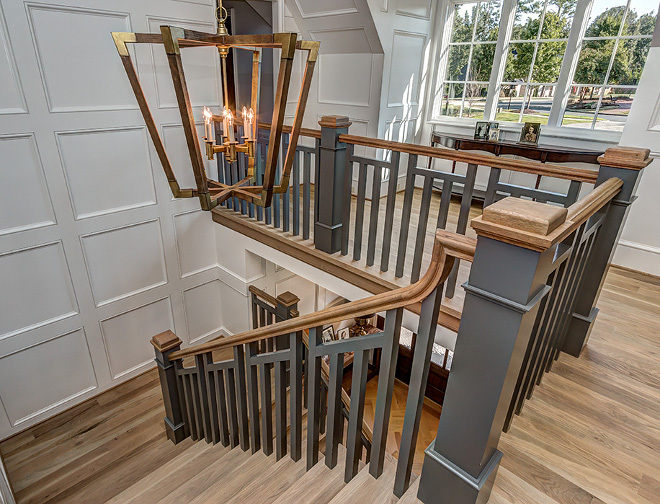 Front Porch Lighting: Lantern & Scroll – custom -similar here, here & here. 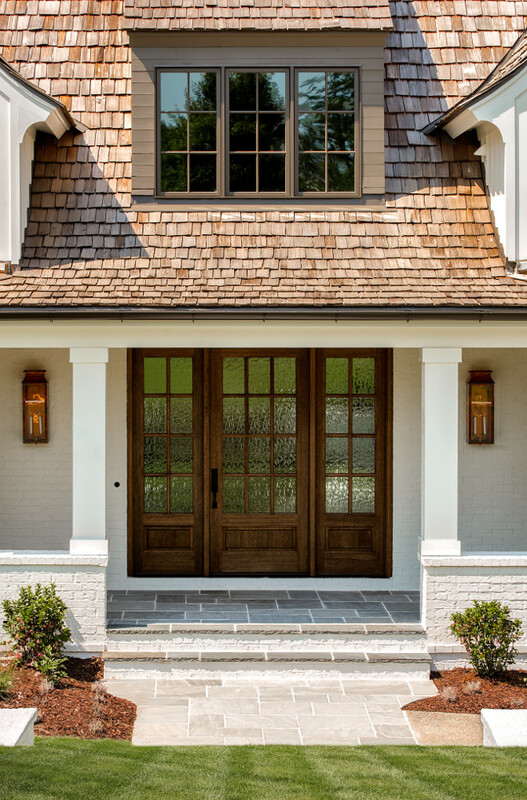 Side Garage Door Lighting (not shown): Charleston Collection, CH 22 with CH 22 Top Loop – similar here. Lighting Over Center Garage Door (not shown): Charleston Collection, CH 42 and CH 42 Top Loop – similar here. 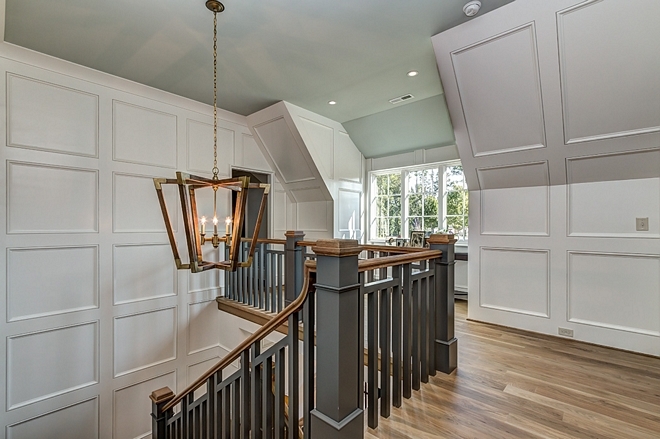 Foyer features wainscoting painted in Benjamin Moore China White. Foyer Table – antique from Dwellings in Asheville, NC – Beautiful Console Tables: here, here, here, here, here, here, here, here & here. – Extra long console tables: here & here (rustic). Beautiful Table Lamps: Here, Here, Here, Here, Here, Here & Here. 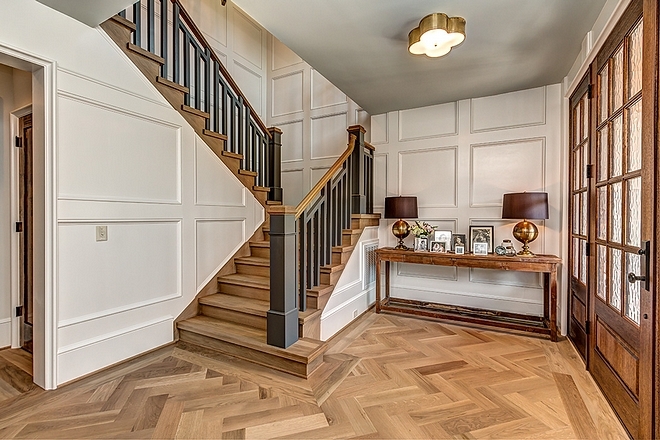 Hardwood flooring is 5 1/4” White Oak with custom stain in diagonal herringbone pattern cut and laid. 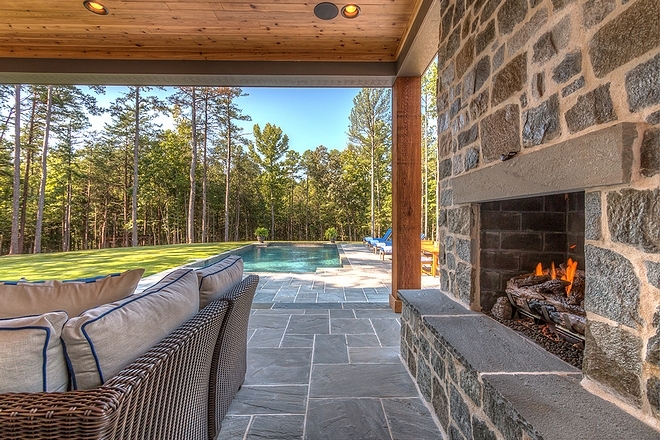 The builder used Loba Invisible 2K – mate finish that is 99% invisible. 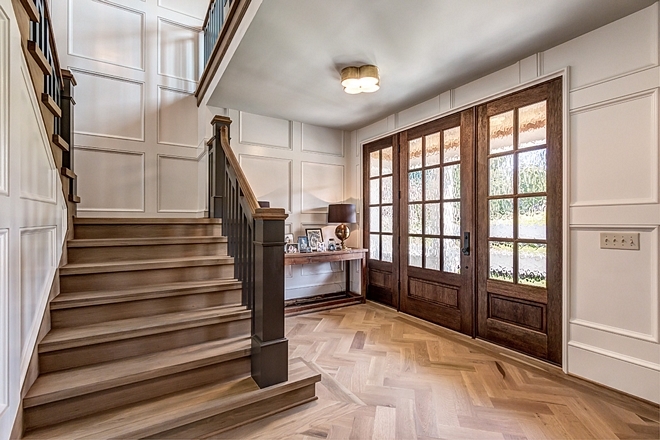 Beautiful Hardwood Flooring: Here & Here. 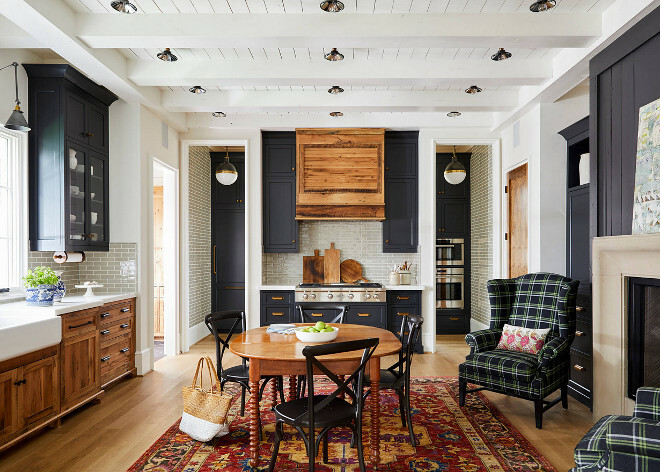 This kitchen doesn’t feature an island, just a farmhouse table. The farmhouse table is an Antique table the designer found in Asheville, NC. 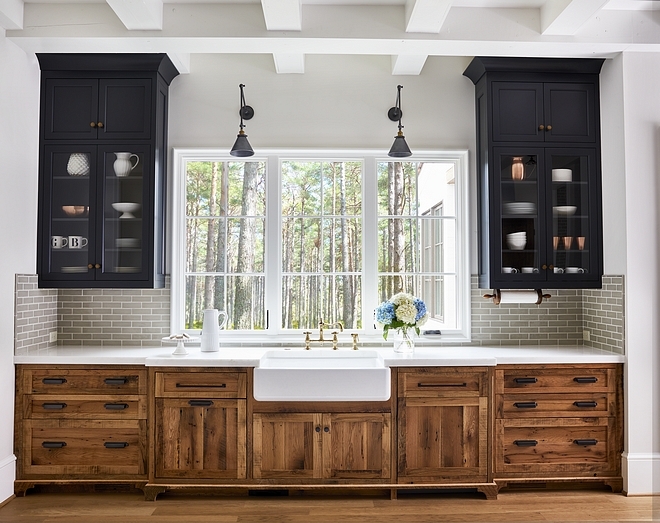 Kitchen ceiling is wood shiplap and beams, all painted in the custom color – very similar to SW Alabaster. Kitchen Dimensions: Kitchen measures 16.4 x 18.4 (not including the scullery behind the rangetop). 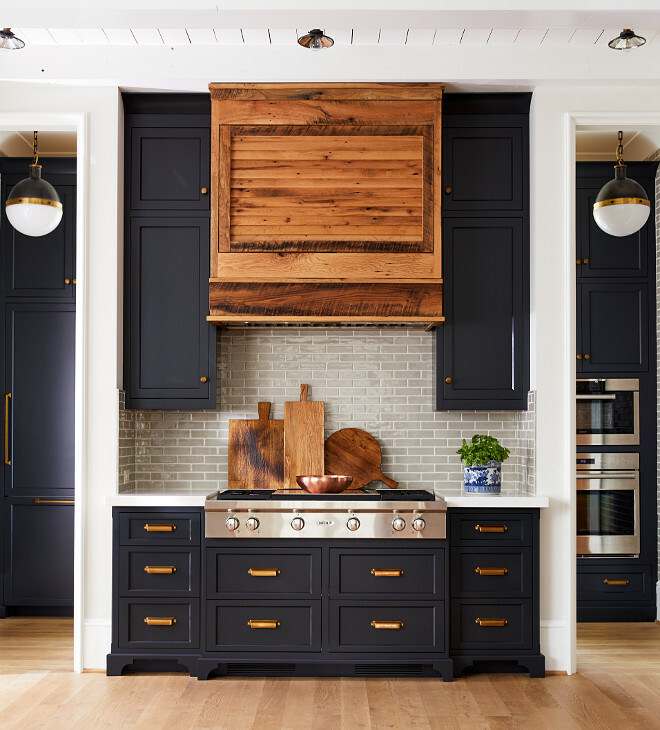 The custom kitchen hood is reclaimed White Oak with a clear, matte sealant. Similar Wood Cutting Boards: Here & Here. The fridge and the double ovens are just behind the main kitchen in the scullery. You can see the paneled fridge to the left of the rangetop under the pendant and the ovens to the right. Cooktop is by Wolf – similar here & here. Kitchen Ceiling Flush Mounts – RH – similar here. 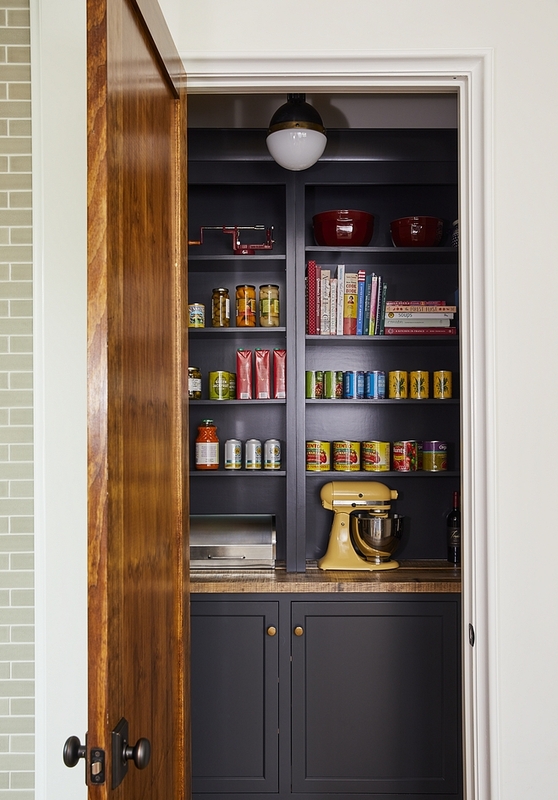 A scullery with its own farmhouse sink and built-in ovens is located behind the range wall. 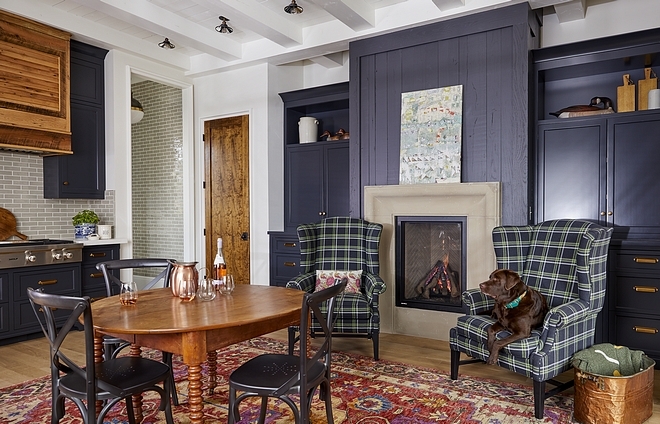 Paint Color is Midnight Oil by Benjamin Moore. 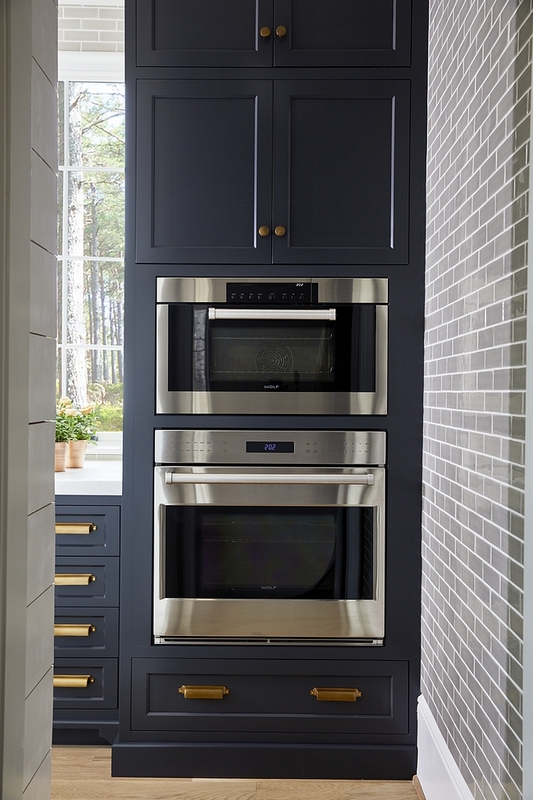 Built ovens are Wolf – similar here & here. Scullery Faucet: Newport Brass in Antique Brass. Scullery Sink: Kohler 30” Whitehaven – here. 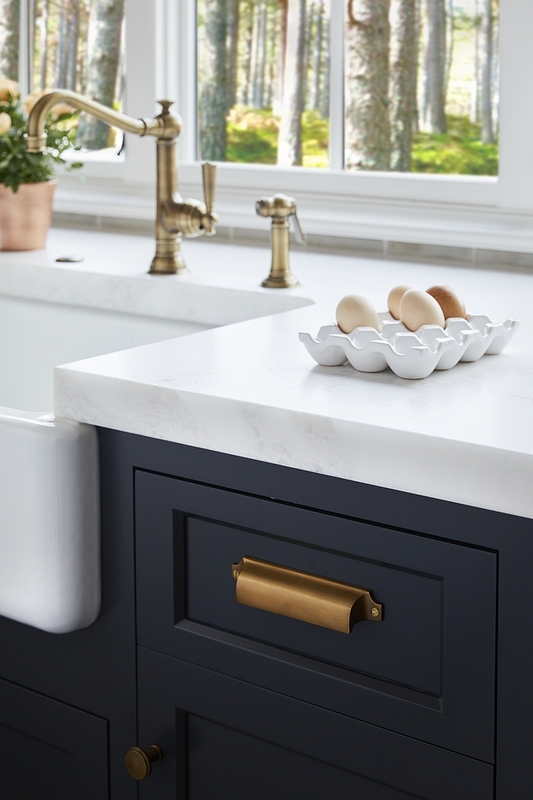 Cabinet Hardware: Pulls & Knobs in Brass. 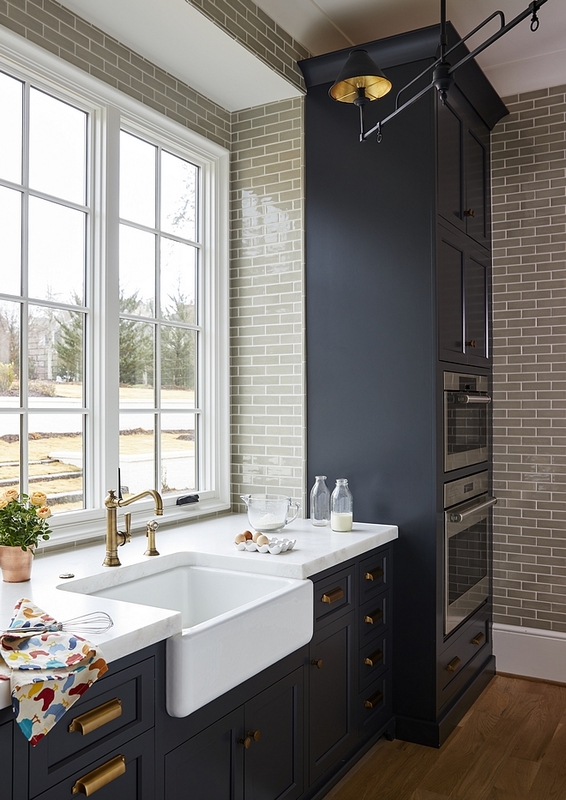 Kitchen backsplash and scullery walls are Walker Zanger’s Gramercy Park crackled tile in Pipe Smoke. – Similar (different size) Here. Countertop is Honed Bianco Avian Marble. I love the idea of having a fireplace in the kitchen. Round Farmhouse Dining Table: Antique. Kitchen Table Chairs – RH Metal Madeleine – similar here. Kitchen Rug: 9×12 Serapi Rug. Kitchen Sink: Kohler 36” whitehaven cast iron apron front sink. 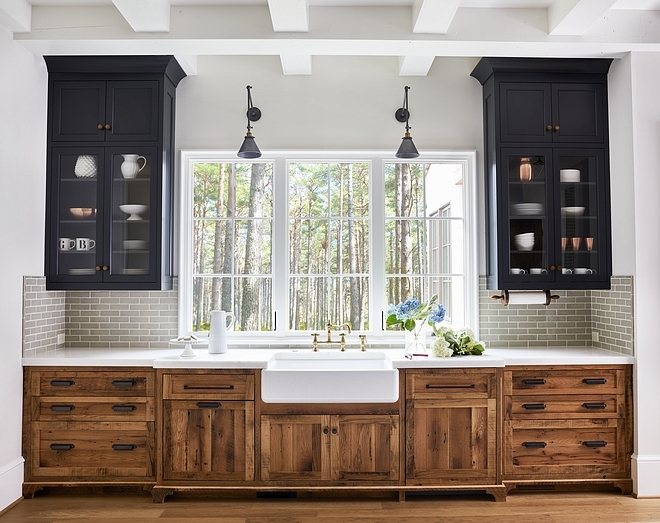 Kitchen wood cabinetry is Reclaimed White Oak with a clear, matte sealant. Kitchen Faucet: Newport Brass in Antique Brass finish. 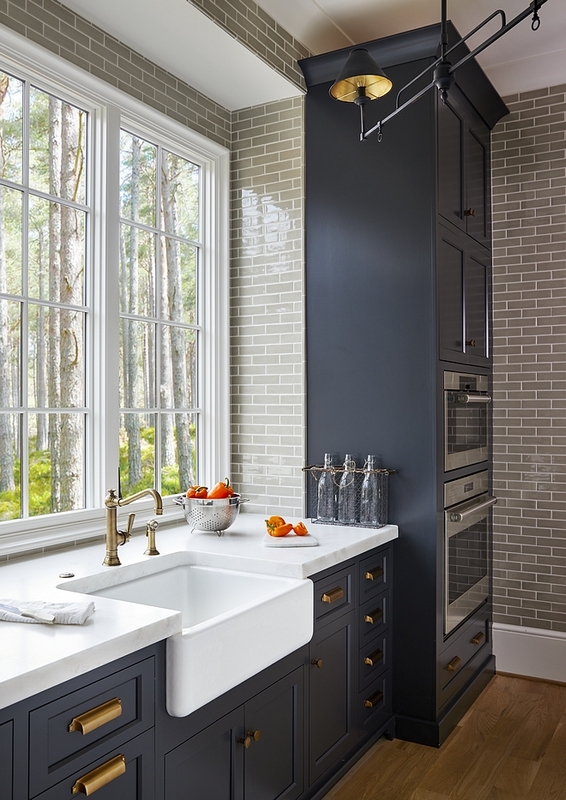 The kitchen countertop is also Honed Bianco Avian Marble. Cabinet Hardware: Pulls & Knobs in Bronze. Benjamin Moore China White PM-20. Similar Kitchen Window Lighting: Here & Here. 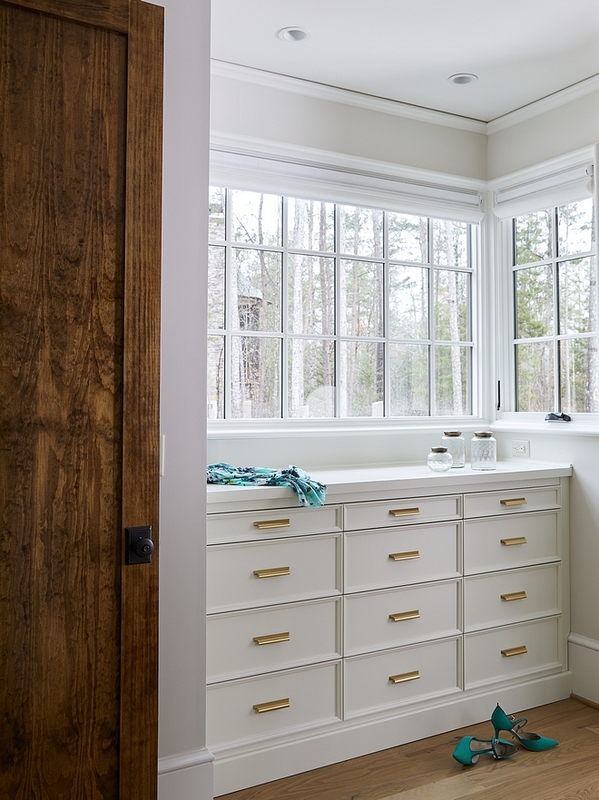 Mudroom also features reclaimed white oak cabinets with a clear, matte sealant. A drop zone desk is located on the left. 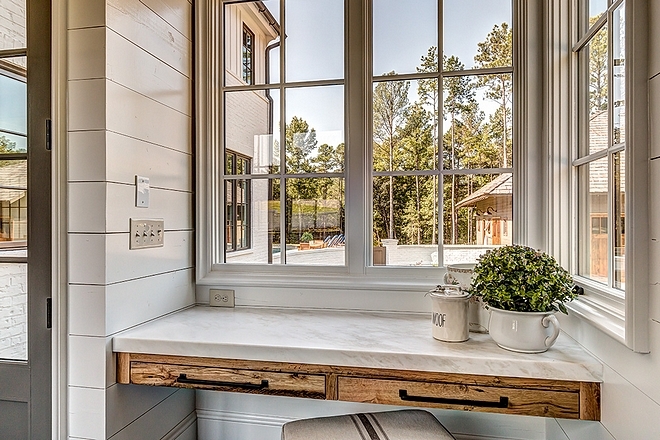 The mudroom drop zone features a Reclaimed White Oak floating desk. The floating desk countertop is Honed Bianco Avian Marble. Walls are shiplap. Rae Dunn “Woof” Large Dog Treat Canister – Here – similar here. 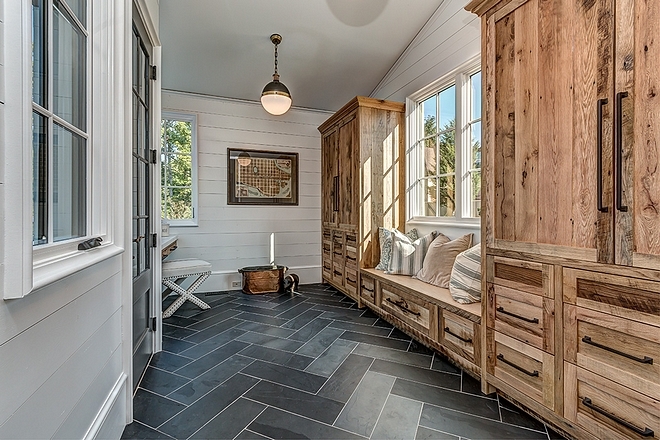 Mudroom / Dropzone floor: Tile Shop’s Adoni Black Slate (cut & laid in diagonal herringbone pattern). 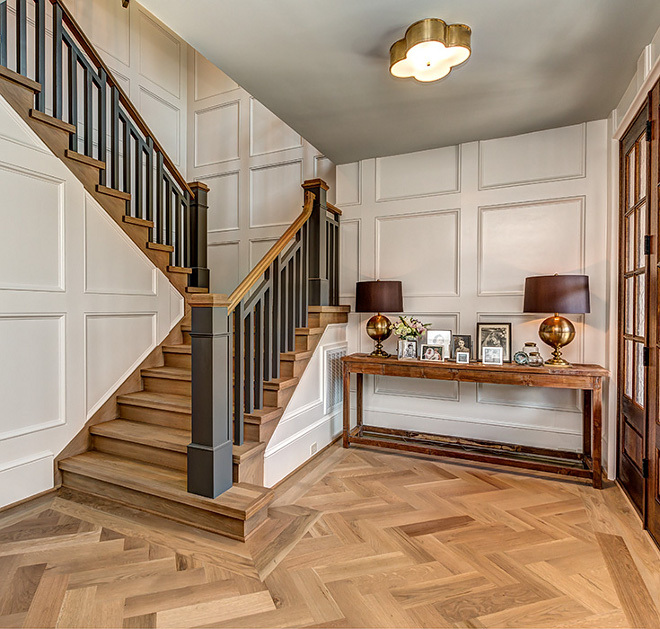 They were larger pieces which the builder had to cut down for the herringbone – Similar here & here (already cut). 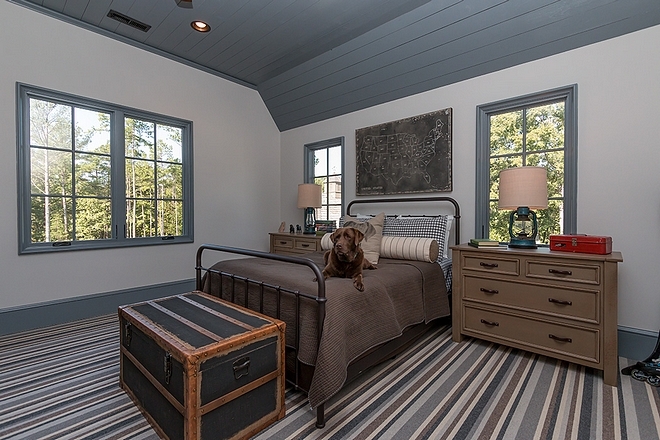 Ceiling paint color is custom but very similar to Sherwin Williams Alabaster SW 7008. 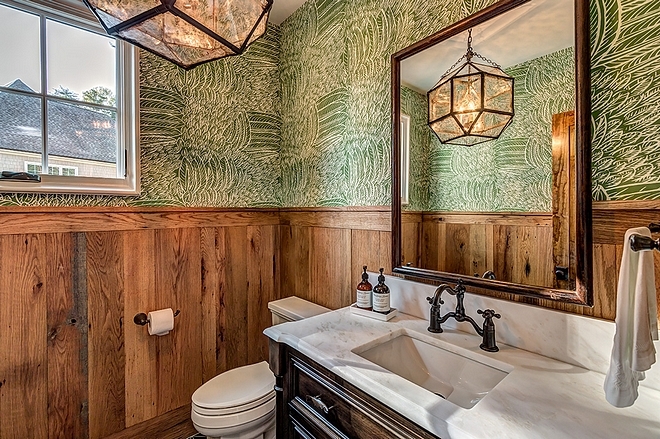 Powder Room features vertical reclaimed wood shiplap wainscoting and a custom built Alder cabinet in dark walnut stain. Countertop is Honed Bianco Avian Marble. Mirror is an antique from Asheville, NC. Wallpaper: Shumacher’s Featherfest in Leaf. 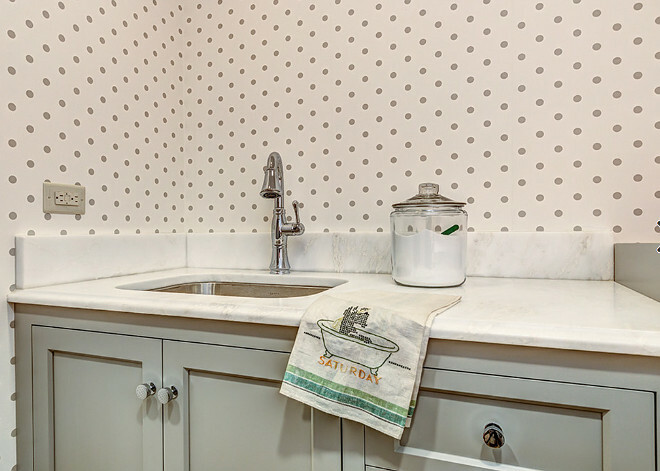 The laundry room features grey cabinets and white marble countertop. 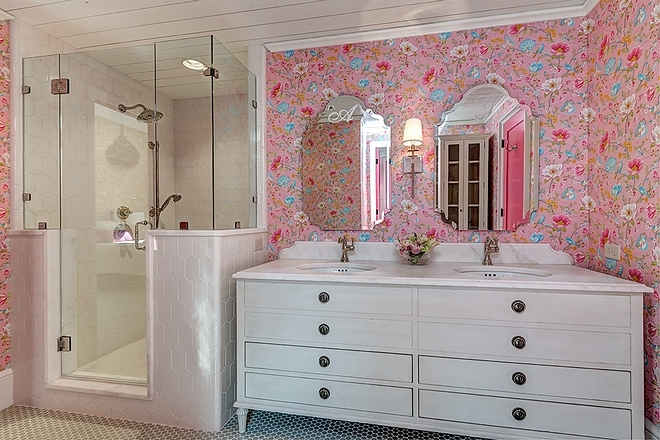 Girls’ Bathroom Vanity: RH’s Maison Double Vanity in Antiqued White (with a custom countertop in honed Bianco Avian) – similar Here, Here, Here & Here. Floor Tile: Walker Zanger’s 6th avenue french clay gloss round mosaic – similar here. 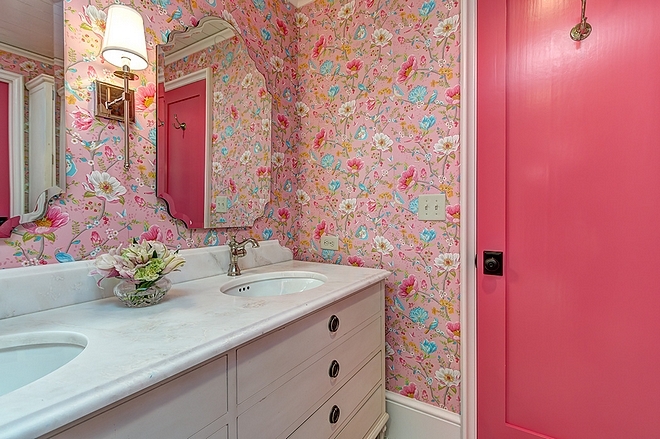 Sherwin Williams SW 6855 Dragon Fruit. Wallpaper: Pip Studio – Chinese Garden in pink. 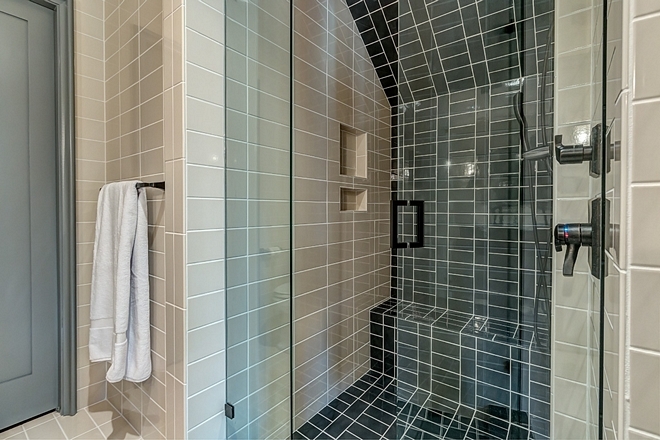 Shower Walls: Walker Zanger’s 6th avenue white gloss cocoon mosaic – similar here & here. 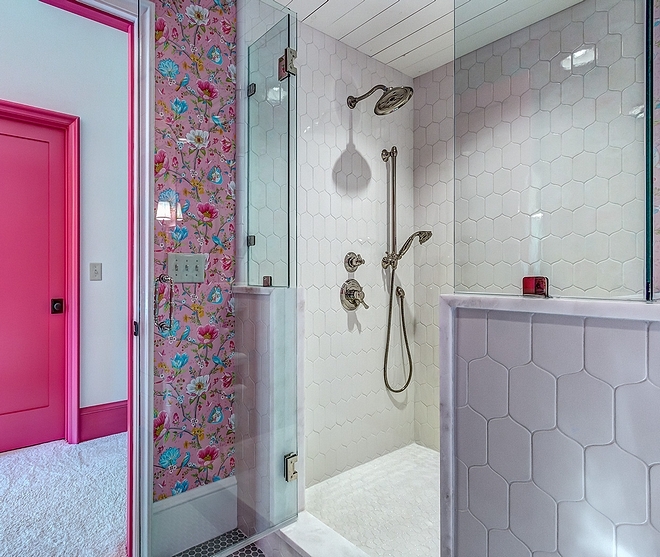 Shower Pan: Walker Zanger’s tilt white daisy mosaic – similar here. Wall Paint Color: Sherwin Williams 7035 Aesthetic White. 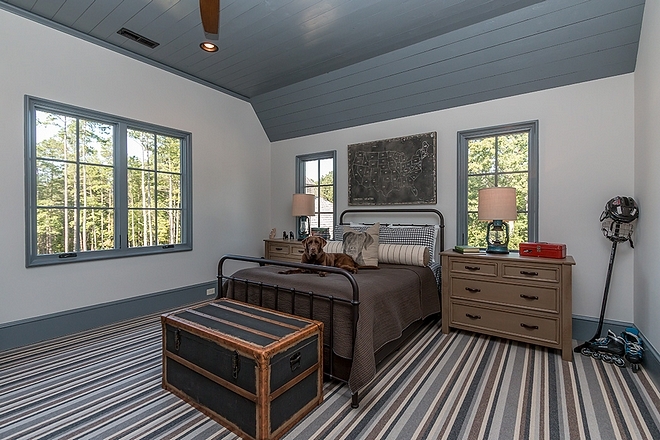 This industrial-farmhouse bedroom features striped carpet, shiplap ceiling and black metal bed. 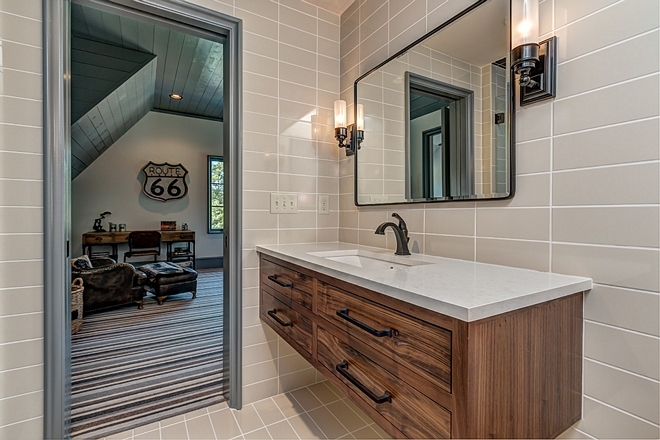 The bathroom vanity is a custom-built American Walnut floating vanity. 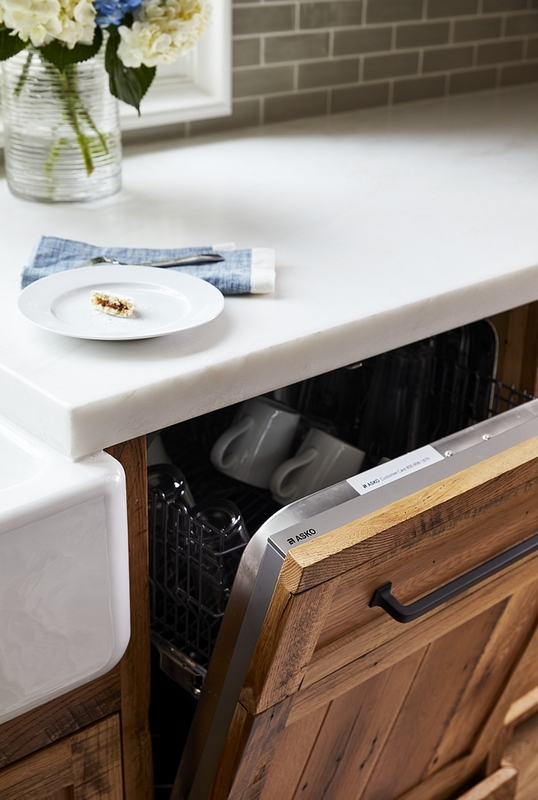 Countertop is white quartz – Caesarstone Blizzard. 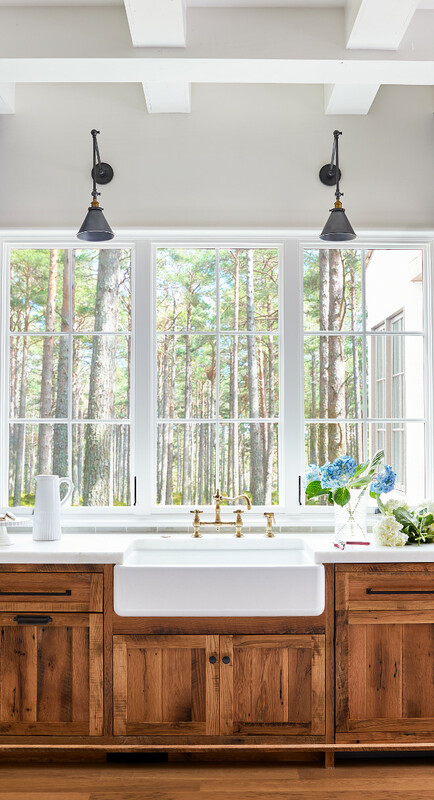 The master bathroom’s wall paint color is Benjamin Moore PM- 20 China White and cabinets are painted in Benjamin Moore Midnight Oil. 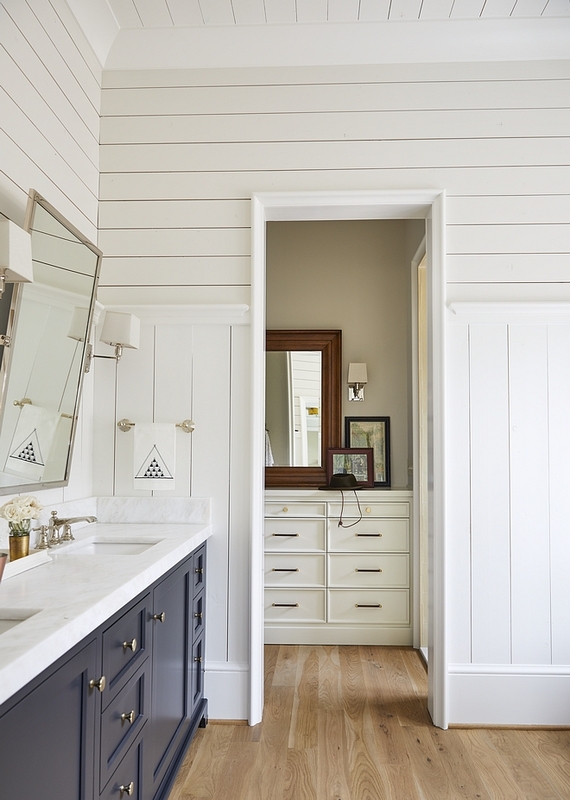 Bathroom also features a combination of vertical and horizontal shiplap paneling. Master Bath & Dressing Room Sconces – RH Claridge Single Sconce. Mirrors: RH – similar here. Shower tiling is a combination of Walker Zanger’s Tuileries Pastis Brique & Arabesque – similar here (white) & here (matte white)- Arabesque: here (white), here (crackle tile), here (light grey) & here (gray). Master dressing Room Built-in Dresser – custom built, painted in custom color, similar to Sherwin Williams Alabaster. 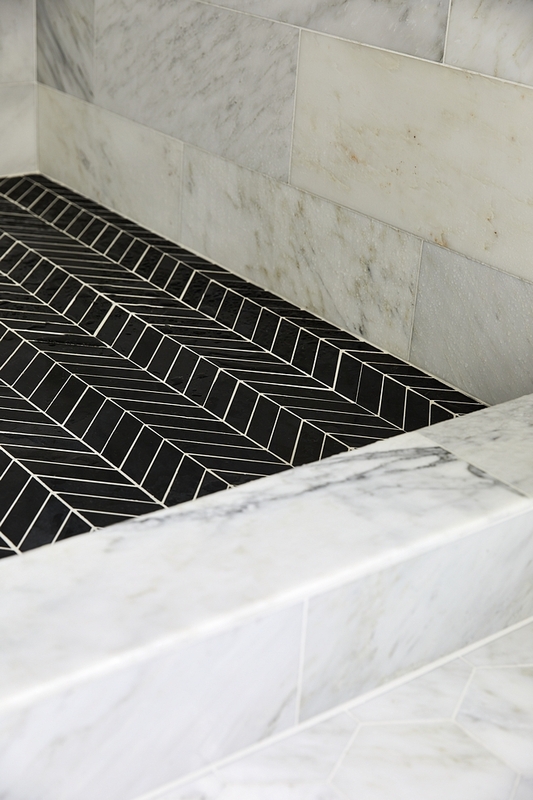 Guest Bathroom Tile Combination: Tile Shop’s 12x24” Hampton carrera marble on walls (similar here) and black chevron tile on floors. 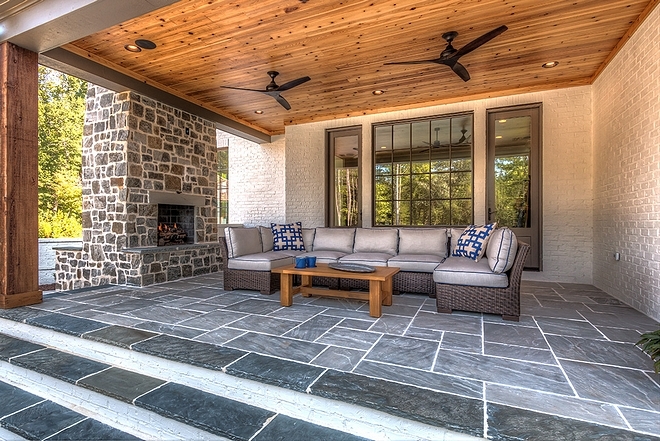 Floor tile is marble hex tile. 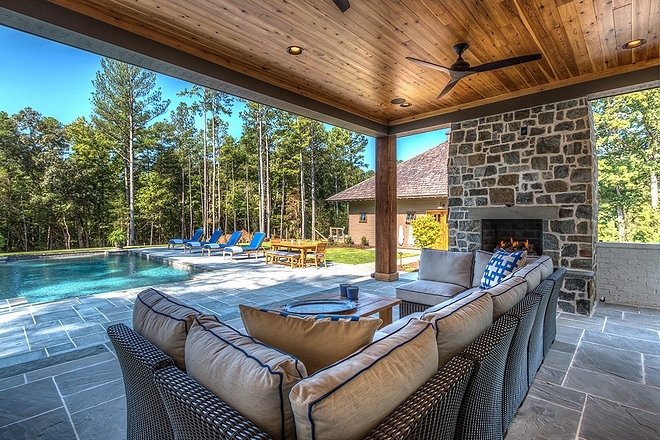 The outdoor furniture is from Summer Classics – Club Woven Collection Sectional in Black Walnut. 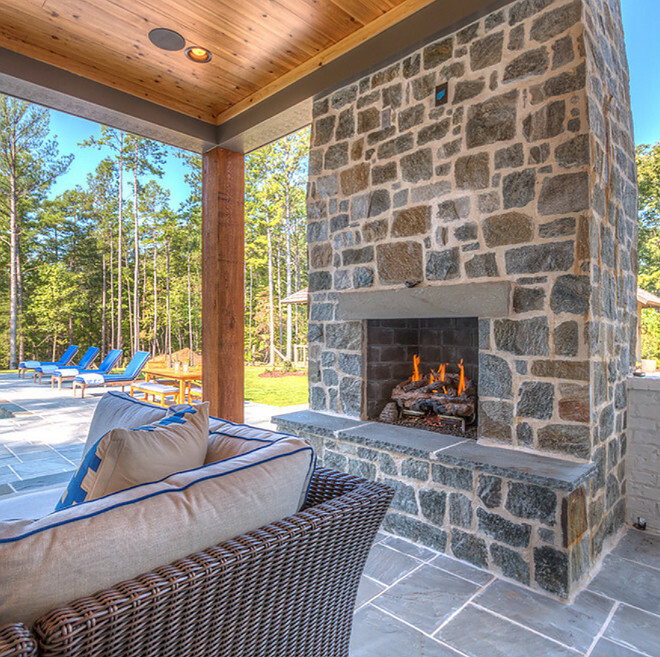 The back porch features an outdoor fireplace with grey natural stone. 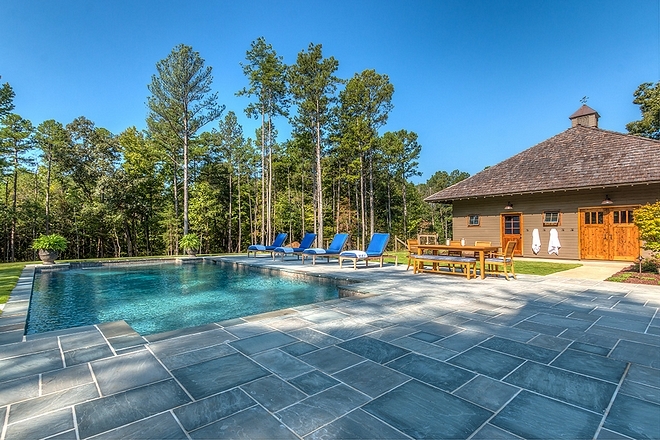 The back porch and pool patio flooring is Bluestone – similar here & here. Ceiling is Cedar tongue and groove. 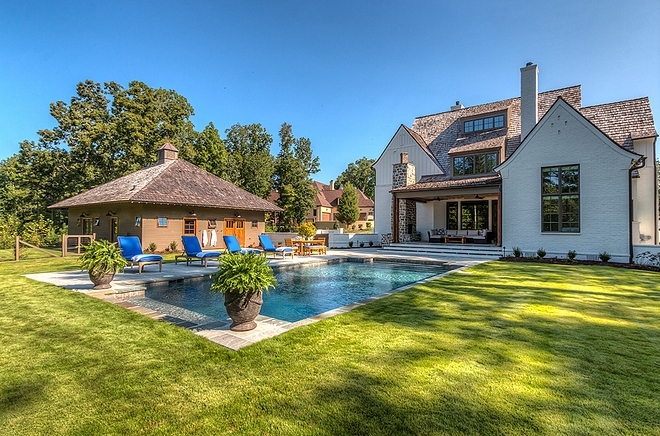 What a stunning backyard! I am loving these big planters with ferns. 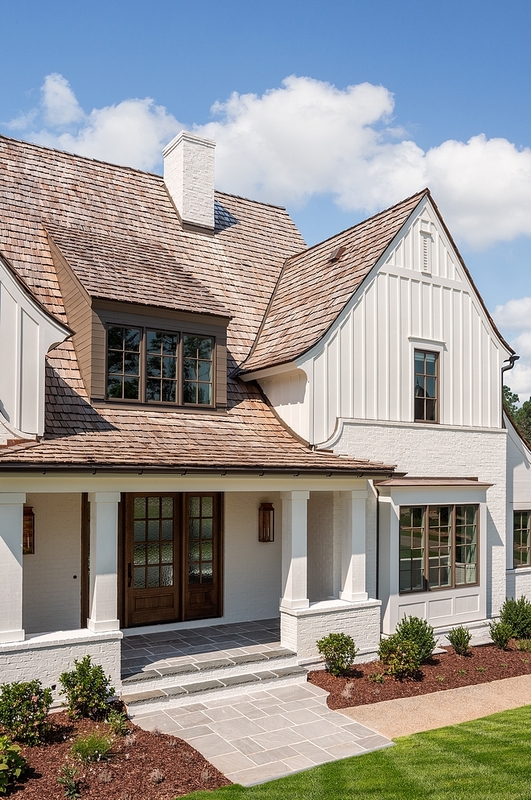 The carriage house is painted in Sherwin Williams Smokehouse. 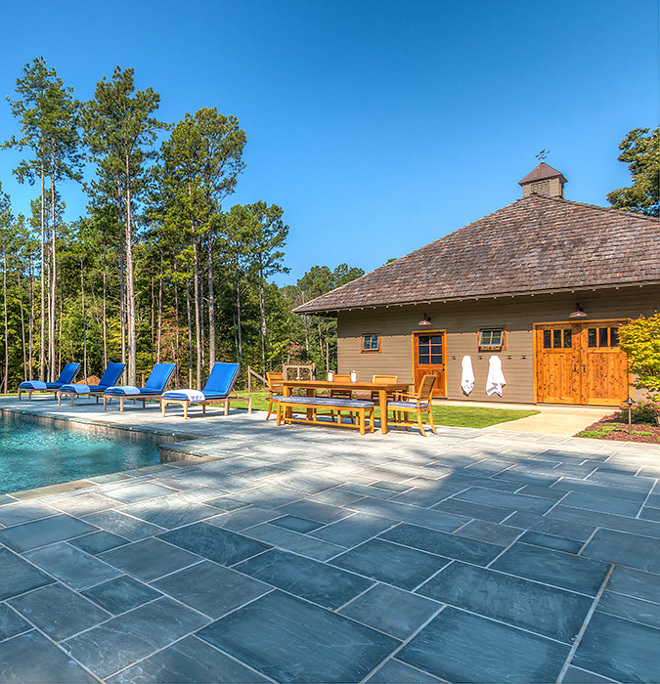 Teak Furniture: Croquet Teak (all in natural teak). 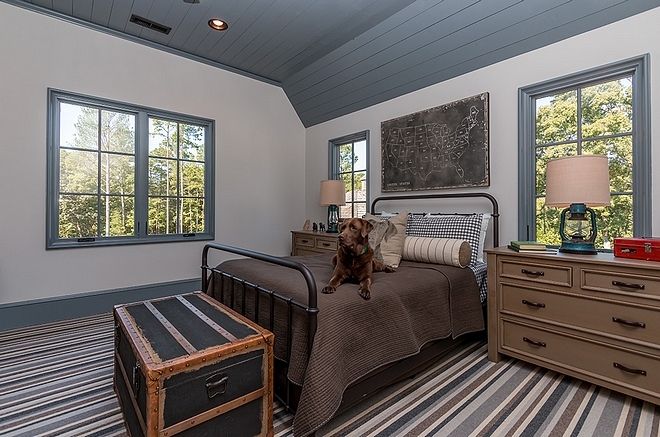 Interiors: New Old, LLC – (Instagram).